SayWhatNews asked “who is The Right Coast”? So we just had to find out. This new phenomenal sensation is sure to rock the house anywhere they go. With amazing vocals, a awesome Pop/Rock sound and a hand-full of cute guys, The Right Coast is truly making some noise in a good way. SayWhatNews: Hey Fellas, thanks for taking the time and speaking with SayWhatNews. Tell us in 3 words who is The Right Coast? TRC: 3 words….. How can we fit all the band members names into three words? This is super confusing, mmmm let me think we have a Pat-Joe Brandon-Doug and a odd-ball Curran. SayWhatNews: How did The Right Coast come to be? TRC: The Right Coast just was really a bunch of friends who had known each other from the local Lancaster music scene, and with the demise of a few local bands we got together started writing adding other friends to complete the lineup. SayWhatNews: Introduce the band to us. Who sings and plays what instruments? TRC: Brandon Ehrgood is the voice of the band, he’s the one with the hair…. Joe and Pat play guitar, we have Doug on the bass guitar, and myself on drums my name being Curran. TRC: Personally I would say I have been influenced to a million different things ranging from Bruce Hornesby, Styx, Rush and many others ranging to more recent Hootie and the Blowfish, Counting crows and Third Eye Blind all were big hits around my household. SayWhatNews: Did any of you guys play sports, in the band, or plays while in school? TRC: I think everyone goes through the sports phase! Brandon played baseball back in the day as Joe wrestled, and I played football and baseball. Sports are awesome! We watch lots of Phillies games, and Brandon is obsessed with the cowboys so there is always a good rivalry with Doug loving the Eagles and Brandon just being confused as we know. SayWhatNews: Oh, Sundays must be fun when the game is on. Ok fellas, tell us something about yourself that no one knows. TRC: Mmmm..… I go by my middle Name and try to keep my first name a secret! Its an on-going game with fans, and I’ve let it slip a few times, but am doing an okay job at it. I think another safe bet is that we all have a secret obsession with Frisbee and foosball, but which consume too much time at our practice spot! SayWhatNews: I’m going to have to research that and see if I can learn your first name. You have me curious now. Lets talk about your music a bit. Your sound is Pop/Rock with an extra twist of Pop. What sets The Right Coast apart from other bands who have a similar sound? TRC: Good question! Brandon’s voice is something that sticks in many peoples minds. He pronounces words differently, and has a very unique style that sticks with you, and is easily recognizable. SayWhatNews: You guys are currently in the studio writing new material. Can you tell us what to expect? Will the songs be similar to your current “This Is Now EP”? TRC: Our writing is going in a crazy direction that is taking all of our influences and creating this upbeat happy, metaphorical style if that even makes sense. Also we just did two songs with Paul Leavitt down in Baltimore MD (all time low, the dangerous summer). It was a great experience working with Paul, and he brought a lot to the table! We’ve recorded “this is now“, and did a new song that really doesn’t have a name yet. The new material is the right coast! I was saying it is “This is Now” but polished, and twisted to an extent creating a more full sound with the same heartfelt lines and hooks that are crafted to make your ear smile. If your ear could smile I guess…. I look forward to recording the new material and seeing how people react! I think it is fantastic! SayWhatNews: TRC fans requested that you sing Taylor Swift’s song “Love Story”, the cover song turned out really good. Have you guys thought of remaking the song with Taylor as a duet? That would be really cool. TRC: We have never thought about that! If that was an option I am sure we would love to consider that as an option! We are all huge fans of hers and Brandon is convinced that they will fall in love and get married, and we all support him in this endeavor. If we could meet her we would be sooo star struck and probably dumbfounded, being unable to speak. Since her album was released it has not left the car, especially for Brandon and myself, since I spend a great deal of time with him driving to practice in his Jetta. If someone can set the duet up DO IT! Get us in touch! PLEASE. SayWhatNews: Now, I really like your song “All She Wanted”. What inspired that song? TRC: Pretty much the same thing that inspires all our songs. Life experiences and the relationships we keep. SayWhatNews: TRC is currently touring, when can we expect an album? TRC: A new album is being written as we speak! This summer we will be doing an extensive amount of touring! Hitting up a bunch of places we have already played, and a bunch of new ones! On April 21st we are launching a new Merch Store, and re releasing our original EP This is Now. Were running some special offers, like order anything from the store and receive a copy of the EP so hit that up, but for new material I’m sure we will be back into the studio laying down an EP or Full Length sometime before winter, gotta keep ya checking back! SayWhatNews: Who would TRC love to collaborate with and why? TRC: This could be difficult because we all have different heroes, and people we look up to. Probably Taylor Swift. Because I love her. SayWhatNews: Each member has their own style. Do you guys have a stylist or do you just dress yourselves? TRC: I feel as if we dress each other? Hahahahaha Pat and Doug I would say lead the style group, and whenever we need to look nice they supply extra clothing to Joe and Brando. I am always out of luck due to me being bigger than the rest of the band so I just wear a grey shirt cause it usually ends up matching everyone else. A stylist would be nice though… Want the job? SayWhatNews: Oh why not, I do know a thing or two about fashion. Speaking of fashion trends. Brandon I have to ask, what inspired your long feathered hair? Its different but yet cute. TRC: Hmmm.. well not really too much inspiration to it ha-ha. Just sorta got lazy and stopped cutting it. SayWhatNews: TRC’s schedule gets busier by the day, what do you guys do for fun? TRC: Frisbee and Foosball is life. We are all super tight as friends, and usually end up spending the extra time we have together, playing madden, or eating pizza. That’s what young adults are supposed to do right? SayWhatNews: Yeah, pretty much, just in joy life. So, whose CD you just cant get enough of? 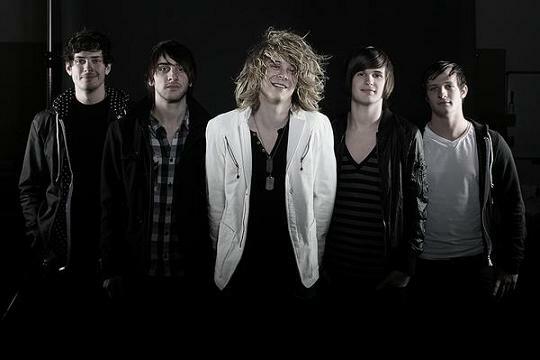 TRC” TAYLOR SWIFT FEARLESS, and our friends in The Dangerous Summer’s New Album Reach for the Sun! We heard a lot of the tracks from them, and while we were recording with Paul! Look out it rules! SayWhatNews: We want to learn more about the band. Which band member is the jokester and who is the serious one? TRC:	Hahahahaha, I know I am going to get bashed on the serious one aspect. Brandon is def the jokester, he is funny, and hysterical 99 % of the time, but gets serious when its time to be serious, he always loves to bust Mr. Serious balls. aka Curran. They really level each other out, since they live together, and spend so much time together. SayWhatNews: What do you guys like to eat on the road? Can any of you cook. If so what is your specialty? TRC: Probably way too much junk food. Swedish fish. A lot of gummies ha-ha. Brandon actually does cook. He cooked at a restaurant for 2 years. SayWhatNews: Are any of you video game junkies? What’s your favorite video game? SayWhatNews: What’s next for The Right Coast?